Food Prepared By : Aunt Mary G.
1. Saute garlic in oil on a cooking pot until fragrant. 2. Add water to pot. 3. Add the yellow eggplant and cover the pot loosely. Boil until the eggplant soften and the skin almost detached by itself. 4. Add in dried assam if preferred. 5. Add in the fish, lemongrass and chillies. Salt to taste. 6. Add fermented durian or MSG for additional flavor. ponas is vegetable soup thickened with grated cassava (ubi kayu)....your sup ikien with tiyung dayak, sedap makan with sagu.....do u mind if i ask, which kampung are you from? actually i myself never tried sup ponas, i only heard of it's description from other people..
"waduh, mosie tu sambal tiung inuh....adin oku jadi natong sambal tiung daya de madang de opui inuh....slurp"
if somebody mail it to you, will the customs there confiscate it? 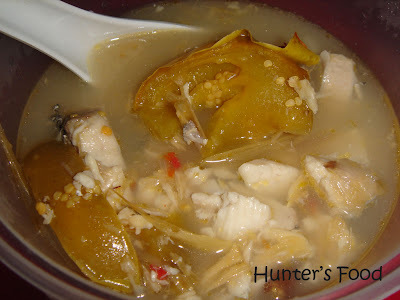 for the sagu linut (transparent wet sagu) I like to eat it with sup tempoyak and serai.. :)~ aduh thinking abt it can make me go crazy sometimes haha!